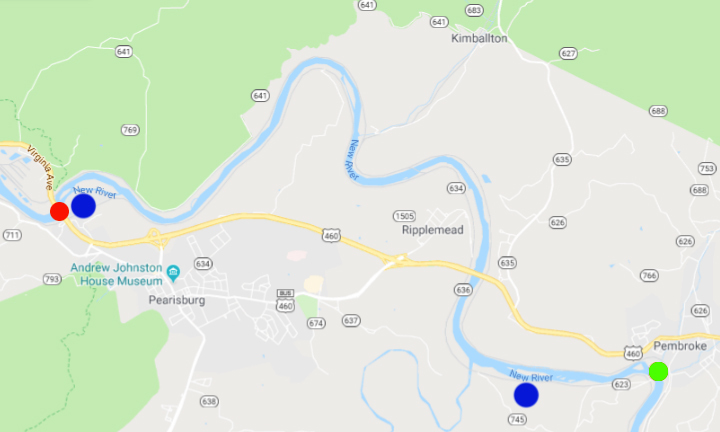 It's not very common that you get to float a river that is flowing from South to North that is situated in the Mountains of North Carolina, Virginia, and West Virginia. Not only that but it's one of the oldest rivers in the world and best of all we are just a short drive away to this awesome body of water. Recently we got a group of friends together for a multiple day float down (or up haha) the New for some fishing, canoeing, camping, and most of all some good times. We put in at Pembroke (the green dote on the map below in lower right hand corner) around dusk and floated a short way to a very nice island camp spot around a mile from Pembroke for the first night. This camp spot was very easy to spot from river left but has a steeper bank while as the back side or river right side of the island had a sandier beach to tie up the boats. This camp spot isn't visible from the river right side of the island but the well traveled trails into the camp spot were very recognizable even with head lamps at dark. This camp spot would easily hold a group of 10 or more but remember to leave it nicer than you found it! Fantastic spot with Horsetail Rush, think small bamboo looking plant that grows two to three foot tall, surrounding a majority of the camping area. The next day we loaded the canoes back up and floated about a mile down river just below a large bridge and luckily ran into one of the best rope swings any of us had ever been lucky enough to swing from! Keep your eyes peeled on river right and you might be lucky enough to find this incredible rope swing just a short ways below the bridge (you can very easily see the bridge from the rope swing)! It honestly was one of the major highlights of the trip and probably the reason we didn't fish after spending a few hours flying through the air into a deep cool body of water! Kyle King (owner of White Birch Juice Co.) taking flight above the New. This was probably 1 of 100 times we hit the swing! After several hours on the rope swing we floated down river for around 8 miles to our next camp spot on the 1 Mile Island just above the Bluff City take out. This camping area was a fantastic camp spot with flat area with trees every where to set up hammocks with little poison ivy around. There is poison ivy along the river pretty much everywhere along the banks so be able to identify and avoid it as best as possible. As for the two camping areas we stayed at it seemed to have very little Ivy for whatever reason but we were very thankful for it. We hung out by the fire that evening and enjoyed a SWVA never frozen fresh from week before 6 pound t-bone steak and four new york strips. When the guys told we we were having steak I was excited but honestly I wasn't prepared for what Andrew, owner and operator of Ridge and Valley Farms was bringing for us to indulge in. OUT OF THIS WORLD and probably has ruined me for all other steak for the rest of my life as nothing will compare to these cuts of meat. The following morning we packed up camp and began our short float for the day to the take out in Bluff City just above the Narrows. We managed to link up with some bass on our paddle out and it was a perfect way to end a fantastic weekend spent outside with good friends. 1. Be prepared for Rapids...they can definitely be tricky so have everything in dry bags tied into the canoe...trust us. 2. Bring water...lots of water...several gallons for cooking, cleaning, and staying hydrated. 3. Make sure you buy a fishing license as this is world class Bass Fishing...might even get lucky and hook into a musky! 4. Pack lots of ice and minimize opening and closing coolers as much as possible. 5. Pack Sunscreen for yourself and don't forget to bring extra for your friends who forgot to pack some as well...you will be on the water all day and at the mercy of the sun beaming down on you! 6. Pack as a group so that all the essentials are brought and no one double packs gear and waste space in a dry bag. 7. Bring a big community tarp for the rain showers that might pop up. We got rained on twice but it didn't ruin the day because we had a huge tarp so we got to enjoy the light showers without getting soaked. 8. Have a shuttle set up and paid for before the float so that when you get to the take out you aren't sitting for to long. We used Tangent Outfitters who also could provided good info on the float! 9. Having a good camp chair can make all the difference when sitting around a fire at the end of the day...would recommend a Helinox Chair as they are very comfortable and pack down small enough that you won't take more space than needed in the canoe! 10. Have a positive attitude...can't plan for everything so embrace the adversity and enjoy the experience!